OMG! I’m so excited! I have Books #1, #2, #4, and 6#. SQUEEEEEEE! I love Dork Diaries and can’t wait to see the movie! Mackenzie is a drama queen, stuck up snob, fashion snob, and a self centered diva who thinks she’s really smart but she isn’t. Mackenzie is such a show off!!!! She went into the double doors in the gym, until Jessica called. She said she saw Nikki wearing an even cuter pirate outfit. Mackenzie tried to find another costume but all the stores were closed. She only had 5 minutes before she reveled herself because she had bragged about her costume. Then she tried to create a costume, but she ended up with the most lame costume ever. A toilet paper mummy. Everyone complimented me on my costume and it was greatest night ever! But of coarse. Every single student hear that. Mackenzie and I ignored each other for the rest of the night. So Makenzie went to Brandon’s House, because she wanted to take Brandon to the CCP section at the party in the gym. Unfortionatly for her, he already went with Nikki. Enraged, Makenzie left on her own and started texting Jason, the most popular guy in school to take her. He texted her back saying he already had a date. She texted ALL of the other CCP guys, but they all had dates. So when she got there, she was the only CCP who didn’t have a date. Humiliated, she tried to find Brandon. When she found him, he was in the dorky area with Nikki. She stomped up behind him and tapped him on the shoulder. Suprised, Brandon spilled his punch all over her designer outfit. The hilarious part was that he also tipped over the ginormous bowl of the cafeteria’s mystery jello that had real bugs in it all over her. One of Brandon’s new “co-workers” came over to ask how to stop video recording on the school camera, just in time to tape it all. They put it not only on the school site, but on YouTube as well. When. Makenzie called her dad, since he had to leave work to get her, he had to bring the van with “Fred the Fly” on the top. Sorry Makenzie! NOT! MacKenzie has a bad reputation from the books. Brandon didn’t go trick-or treating and he passed out candy. And it so happend that she came to his house, came inside with no warning, and started flirting with him. Then, his grandfather came into the room and swatted her out of the house::):):):):):):):):):):):)!!!!!!!!! as Mackenzie was looking at herself someone startled her and she smeared lipgloss all over her face an then someone took a picture and sended it to the whole school.!!!!!!!!!!! I don’t blame Nikki for being sooo upset at Mackenzie, Do you? Nikki is just mad at her because Mackenzie is just a bully, and thinks she is ALL that. Wait, let me rephrase that. Nikki is just mad at her because Mackenzie is just a BULLY, and THINKS she KNOWS she is all that, but she isn’t. She is just an ordinary girl who wears expensive, and bullies people because she doesn’t want to get bullied. That is why Mackenzie bullies other people. Yes!!! I really dislike how badly MacKenzie is treated! Nikki should really try to warm up to her, usually the people who are the meanest really need someone to be nice to them! MacKenzie is so misunderstood, at least from how I think on it. You can’t just be mean back to a bully, that solves no problems. you guys really wearing those halloween costumes while following me?! My dog would really want to vomit on your “costumes”!” Where did that girl learn her manners? Preschool? OMG! She is so hopelessly VAIN! “Mackenzie Hollister when will you stop stealing your little sister Amanda’s hoop earrings? !” and then Mackenzie and her mother were having a heated argument OMG It was soooo heated that it practically set MY halloween costume on fire! In the end Mackenzie’s mom said “Young lady, because of what happened tonight you are going back home and I have a new costume for you to wear- a ghost costume! You’ll be wearing a sheet on your head for the entire night!” “But mom-” “No buts young lady!Now you’re coming with me!” And when Mackenzie came back She was in a sheet! every WCD student was pointing and snickering! The roach mobile number two! She was applying her makeup, until she realised that her poodle fifi had chewed her expensive designer heeled boots and she angrily put on a pair of chanel black heels. She strut out the door, walked to her dad’s white lambigini but realised she forgot her designer purse. “OH MY GOSH!” she huffed. and grabbed her purse. When she arrived at the party, she went to the CCPS and realised Jessica was wearing the same costume “HOW DARE YOU GET THE SAME OUTFIT AS ME YOU LOOK HORRIBLE JESSICA SERIOUSLY GO CHANGE!” And the Mackenzie threw her coke on Jessica’s costume. ‘AAAAAAAH MAAAAAAACCCCCKKKKKEEEENNNNNZZZZIIIEEE!!!!!!!!!!!! I HATE YOU!” Jessica stormed off. 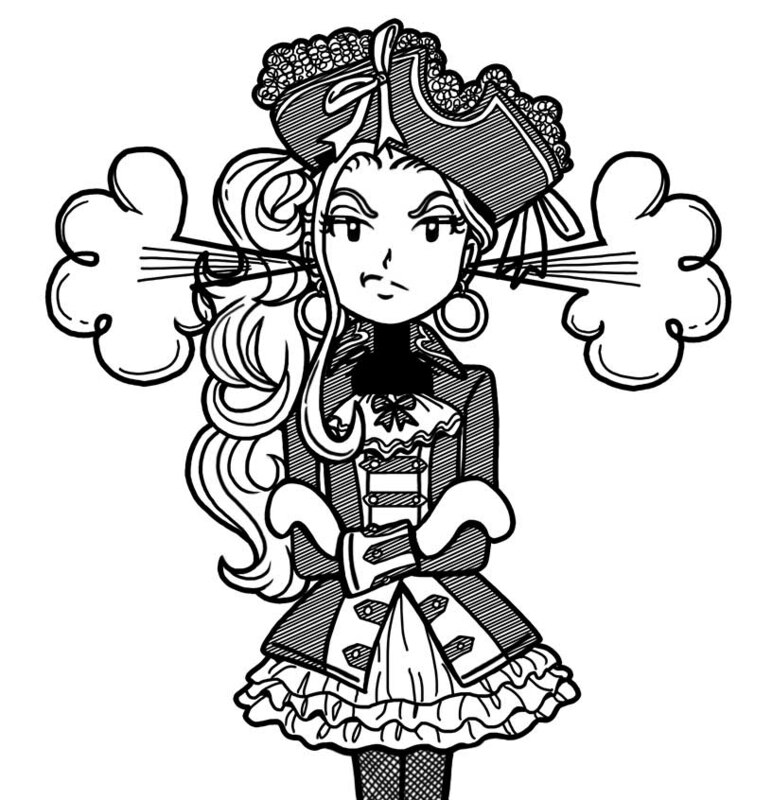 Now that Mackenzie was the only pirate girl, she finally put her head up. She spotted Nicki standing by the chocolate fountain and strut toward her. Then Brandon walked up to Nicki, Nicki blushed at something Brandon said. Mackenzie got angry so strut even strutter (if thats a word) 🙂 when she reached Brandon & Nicki, she stuck her hip out and put a hand on it, posing. “Oh hi Brandon! Great costume!!! Superman, very nice.” Nicki stood there uncomfatbly. “I like your pirate costume.” Nicki murmered. “I know. You have a nice Alice in a wonderland costume.” Mackenzie commented. “though it look like your a slave.” She said and spun and walked away when she tripped on a fake spider web. she landed on Theodore her makeup smudge when his drink fell on her. Everyone started laughing. She walked out the door and started crying when Nicki came out. “Are you ok?” she asked. “GO AWAY THIS IS ALL YOUR FAULT NICKI GO GO GET LOST GO FALL OFF A CLIFF OR SOMETHING I DONT CARE JUST GO!” Nicki ran away crying. Mackenzie realised her heel had broken off her shoe. She went to text her dad to pick her up but her phone had broke from dropping it on the floor. She walked home as her mascara dripped down her face from crying so much. Later on, after trick or treating, MacKenzie went to a big Halloween party over at Jessica’s house. The party was really only for the CCPs. So like, when she got there, she had a blast until she found out that her awesome pirate girl costume deluxe that she got for over $100 had a HUMONGOUS rip in the back. She ran to the bathroom to try and fix it, but it was no use! MacKenzie was so humiliated that she had to call her mom to come pick her up from the party early. The next day at school, everyone was talking about the incident. The gossip spread like wildfire, and soon Nikki, Chloe, and Zoey had heard all about it. Of course, this was basically the BEST thing to happen to them! Maybe MacKenzie will get off their back a little now that she has been humiliated in front of everybody! Hey guys, please rate my story from 1to 10. It would really mean a lot! 😉 I want to be a writer one day and I wanna see how good you guys think I am. Here is the scale. Please say the truth, it won’t hurt my feelings. 🙂 And please tell me why you did or didn’t like the story too. Thanks! I loved it because it was awesome! Than she wants to be a ghost instead.. So she tries to find her costume at a designer shop (that was actually beside Walmart!!) but she couldn’t find anything so she takes a used sheet over her!! Mackenzie overheard this girl at school flirting with Brandon. When she told girl to back off she did not know that her mic was on from when she was singing at the Hallowen party! Every one at the party overheard. Luckily for her Brandon heard! why should Mackenzie always be mean? IKR? I mean, seriously, I don’t think anyone can be that mean. That was one weird story that happened to McKenzie, but she deserved it because she is so mean and horrible to other people! Everything went downhill when me,Chloe and Zoey were trick or treating in HER neighborhood while Mackenzie was looking for people to gossip too. Then in a taunting way Mackenzie said to us” Hey dorks!! Nice costumes”!! Then she sashayed away. I HATE it when she sashays. Since that, I turned on to another street where Patrick lives. I THOUGHT that I’d never see him again, but boy I was wrong!! He STILL was with his best friend Jacob at a Halloween party. He had a bucket of water in his hand and used it to wet the younger kids. When Mackenzie ringed his doorbell, he dumped the bucket of water on her. “WWWAAAAAAAAAAAH”!! screamed Mackenzie. We went on the next street. I was my alto ego Dork Girl and had a cape that said DG on the back of it. “Mackenzie learned her lesson”, Chloe said. Zoey agreed. “Boy, I am ready to go home”, Zoey said. We went to my house for a sleepover. We layed out our sleeping bags. It was ONLY 7 PM so we had a lot of time to play. “Let’s play Truth or Dare”!! I said. “Okay”, Chloe said. It was my turn. “Chloe, Truth or Dare”?? I asked her. “Dare”, Chloe said. I dared Chloe to jump in the freezing pool water. After multiple rounds of it was 8:30. I was about to take my phone out, but BRIANNA came in my room and swept my phone out of my hands!! “Zoey”, I said. “Give me a minute”. Zoey waited. Chloe seemed to run like a screaming chicken. But before I could find Brianna, she was playing a Princess Sugar Plum game on my phone. I was SO mad that I could squeeze her!! Two hours went by, and it was time to go to sleep. In the morning, we had NO bratty Brianna so we just talked for the rest of the time. In fact, I can’t wait for ANOTHER sleepover with them. It was AWESOME!! Now what do u rate my story?? 5: It is average I guess. 10: Keep doing it!! Write more stories!! I think your story was a #5 but I think you tried really well. If I was your teacher, I would give you a A-. Next time add more detail. I choose……………… 7. No wait, 10!!!!! Raina, thanks for your honest thought in a non bragging way. I like it. We just finished up our sleepover. Zoey’s mom picked up Chloe since her mom was working at school. It was Monday and I was ready for the next day. I went to first period homeroom. I tried to sit down and concentrate on my math work, but ALL of those memorable moments from last night were tough to get off my mind. Then I saw her. HER. The girl with EVIL blue eyes. She wears designer clothing. And like DUH she also wears lip gloss. It was Mackenzie!! “What are you doing DORK”!! Mackenzie asked me. “Nothing”, I told Mackenzie. Then I saw Mackenzie take out her pink I phone. She went to the computer lab to upload ANOTHER video from last night!! When computer class came I did one check on YouTube to see if Mackenzie threatened me again. Nope. When I got home it was MISERY. Since the video that got 7 views and gone viral around the whole school I hope that NEVER EVER happens again. The video got 28 views already and it already had 5 likes on it!! When I came to school the next day, I heard people talking about something. “Hey LOSER”!! Jessica said straight to me. “The video has been seen by EVERYONE in this school. INCLUDING me myself”, Jessica told me. Seen by everyone?? Gone viral?? Those thoughts were on my for the entire day. I talked to Chloe and Zoey about it. “We saw the video,” Chloe told me. “You were ADORABLE”, Zoey said. The people who liked the video were Chloe and Zoey, Brandon, Theo and Brandon’s grandmother. I walked to my locker very upset. I tried to give out some sun, but EVERYTHING that I tried did not work. I told Chloe and Zoey to come to the janitor’s closet during lunch. After we got our lunches, we went to the janitor’s closet. “Why would Mackenzie try to threaten you”?? Zoey asked. “I DON’T know”, I said. Chloe sipped on her milk. “Check out this romance novel I checked out”!! Chloe shouted. When she showed the cover me and Zoey almost gagged. “What is that on the cover”? I asked. MacKenzie is upset because Brianna bit her designer jeans and ripped them because she thought Mackenzie looked like the tooth fairy!